Holding two big boat shows, a major arts festival and the Super Bowl in Miami on Presidents Day weekend 2016 would give a lot of people second thoughts about attending the boat shows, according to an online survey. 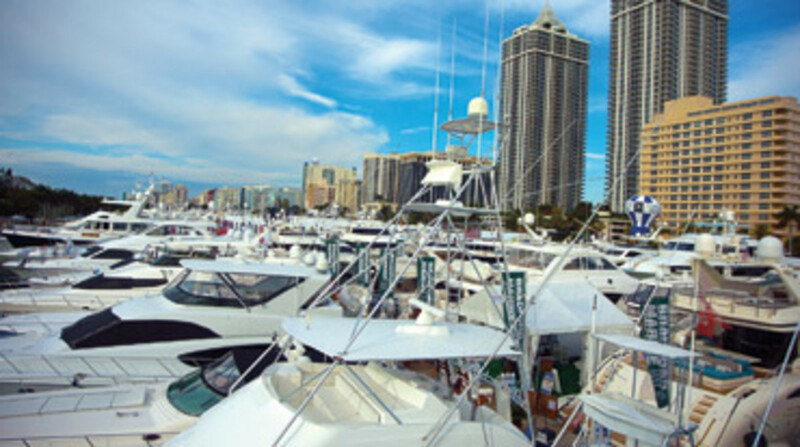 Respondents say anticipated hassles with parking, crowds, pricey hotel rooms and other inconveniences would lessen their interest in attending the boat shows, according to the survey undertaken by Show Management, which manages and produces the Yacht & Brokerage Show in Miami Beach. The online survey was sent to a database of past Show Management boat show attendees. A similar survey was sent to exhibitors, as well, and the results also reflect concern. One in three (34 percent) say they would be less inclined to participate in either the Miami International Boat Show or the Yacht & Brokerage Show. Nearly three in four (65 percent) of the industry people are concerned about parking and inconvenience, and more than half (54 percent) are less likely to attend because of much higher hotel costs. Only one in five say they would likely attend the Super Bowl in addition to one or both of the shows. The three areas the industry group feels would most need attention are parking availability and pricing (76 percent), hotel accommodations and special boat show room pricing (68 percent) and bus transportation to and from the shows (51 percent). Fifty-three percent of consumer respondents say they would be less likely to attend the Yacht & Brokerage Show and/or the Miami International Boat Show if the shows were held the same weekend as the Super Bowl. Forty percent of consumers say they would attend one or both shows, no matter what the dates or if they fell on the same weekend as the Super Bowl, according to the Jan. 17 survey. The National Football League reportedly has invited Miami and San Francisco to submit bids by April 1 to host the 2016 Super Bowl, but is requiring bidders to agree to leave open three consecutive February weekends, including Presidents Day weekend, as possible dates. The later dates would kick in if the NFL decides to extend its regular season to 18 games. The Coconut Grove Arts Festival, in its 50th year and one of Florida’s most prestigious cultural events, claims to draw 120,000 visitors, the Miami International Boat Show another 100,000, and the Super Bowl more than 100,000. 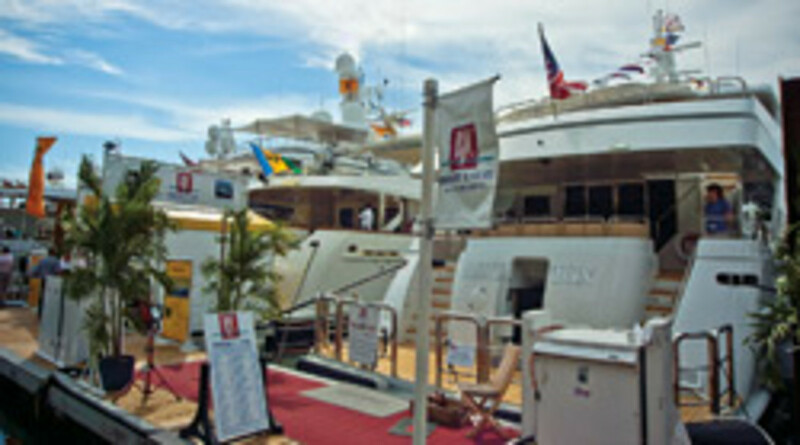 (The Yacht & Brokerage Show is free, so it has no ticket sales from which to estimate attendance.) The potential influx of all those visitors has stirred passionate debate over whether Miami-Dade can support them on one three-day weekend. Many consumer respondents expressed similar concerns. • 69 percent say they would be hesitant to attend the boat shows with the Super Bowl in town mainly because of limited parking and other inconveniences related to Super Bowl crowds. • 62 percent would be less likely to attend one or both boat shows to avoid the crowds. • 55 percent would be less likely to attend the shows to avoid higher Super Bowl-priced hotel rooms. • Fewer than 1 in 5 (16 percent) said that they would be more likely to attend the shows if the Super Bowl were in town. The Miami show has been scheduled on Presidents Day weekend since the mid-1940s. Zimbalist and Cathy Rick-Joule, vice president of boat shows for the National Marine Manufacturers Association and manager of the Miami International show, say moving the two events from Presidents Day weekend in 2016 is not an option. “We’re together on this issue,” says Zimbalist. Rick-Joule agrees. “Our position is there is no compelling reason to move the boat show off Presidents Day weekend, and we have no intention to do so,” she says. She, too, says sharing the weekend with the Super Bowl would discourage show-goers and reduce the gate. The NMMA show generates a $1 billion impact for the local economy annually, which includes revenue for hotels, restaurants, taxis, boatyards, marinas, dealerships and manufacturers, says Rick-Joule. In 2010, the Super Bowl delivered an impact of about a third of that figure for South Florida, but it also is an enormous publicity machine for the host city, with a potential worldwide audience of 1 billion through various media. Cromwell Littlejohn, a director of the Florida Yacht Brokers Association, which owns the Yacht & Brokerage Show, says the residual economic impact of the boat shows within the marine industry continues for months after Presidents Day weekend, as deals are consummated and boatyards, marinas and dealerships service, fit out and refit boats sold during the show. Littlejohn says it’s critical to have the brokerage show on the three-day weekend because it encourages show-goers to come from afar and stay three to five days. “We need that group that doesn’t have to work on Monday to be at the show,” he says. FYBA president Lon McCloskey, owner of The Marine Group of Palm Beach yacht brokerage, aired other broker concerns. He says traffic already is bad during the shows and it could get worse. Hotel rates are high, he says, and they could get higher. He says he would prefer having the shows and the Super Bowl on different weekends, but if that isn’t in the cards he thinks the Yacht & Brokerage Show could weather the traffic snarls. And the kind of client who attends that show — a showcase for luxury yachts — could handle the higher hotel rates, but “if there’s a shortage of hotel rooms due to the Super Bowl crowds, people may not come [to the show]. That’s the one caveat,” McCloskey says. He argues, too, that hosting the Super Bowl, arguably the world’s biggest sporting event, in north Miami-Dade simultaneously with the Yacht & Brokerage Show on Collins Avenue and the Miami show at the Miami Beach Convention Center and two Miami marinas — altogether one of the world’s largest agglomerations of boats at one time in one locale — could result in some synergies. “The kind of people who go to the Super Bowl are boat buyers and owners,” he says. The Daytona 500 usually runs on Presidents Day weekend, and often Daytona fans drop in at the show on Friday and Saturday, and fly or drive up to Daytona Sunday for the races, McCloskey says. Miami Beach hoteliers also weighed in on the issue, with divergent points of view. “I don’t think we have strong feelings about this,” says Greg Cook, general manager of the Eden Roc Renaissance Resort and Spa and chairman of the convention sales committee of the Greater Miami Convention and Visitors Bureau. The Eden Roc is right across Collins Avenue from the Yacht & Brokerage Show. Zimbalist says it isn’t feasible to move the dates of the Yacht & Brokerage Show because his organization leases space from some 30 hotels, condominiums and apartment buildings along Collins Avenue to accommodate the show and reserves large blocks of hotel rooms at show rates for exhibitors and attendees — and many of these contracts and reservations already have been negotiated for 2016. “[The leasers] all have their own plans and budgeting,” he says. Plus, the Miami and Miami Beach shows are scheduled so they don’t conflict with other boat shows internationally, and if either show changes its date it causes scheduling difficulties for exhibitors and attendees who make commitments to be at other shows. “Each year we [show planners] work together to make sure that our events are spaced apart,” he says. Ideally, Zimbalist would like the NFL to schedule Super Bowl L on either of the two weekends in February that are not Presidents Day weekend. “We’re great fans of the Super Bowl,” he says. He just doesn’t think it ought to be on the same weekend as the boat shows. A weekend before the shows or after the shows would work, he says. If they have to run on the same weekend, then he’d like to see the boat shows and Super Bowl segregated, to the extent they can be. “I think the issue will be how to contain Super Bowl traffic in areas that are away from the boat shows,” he says. “That’s what we want to work with the city on: Have them segregate the two [events] so you don’t have a lot of competition for the same roadway, the same hotel rooms and the same parking spaces. “The question is, if someone’s going to the Super Bowl in Miami, will their first choice be to drive there from Fort Lauderdale [or from Miami]?” Zimbalist asks. He fears Super Bowl fans will find Miami more convenient, increasing traffic and driving up hotel rates for boat show attendees and exhibitors. The Greater Fort Lauderdale Convention and Visitors Bureau says there are 34,976 rooms at 561 hotels in Broward County; the Greater Miami Convention & Visitors Bureau says there are 50,000 rooms in 460 hotels in Miami-Dade. The NFL reportedly requires cities that bid for the Super Bowl to have enough rooms within an hour’s drive to accommodate 35 percent of the stadium capacity for fans (or about 27,000 rooms if the game is in Miami) and another 20,000 or so rooms for NFL-related groups, including the media. These rooms are offered at rates controlled by the NFL, but the rates for rooms that are not under that contract are driven by supply and demand. At Indianapolis, a no-frills motel room that usually goes for $42 a night was priced at $800 for the Super Bowl 2012 weekend because of a shortage of hotel rooms. Rooms for the New Orleans Super Bowl in 2013 were going at eight times their normal rates, a $60-a-night room fetching $470 and some fancier hotel rooms going for $1,000 a night. Grossman says the boat shows already have negotiated long-term agreements with Miami and Miami Beach hotels to set aside blocks of rooms for the boat shows in 2016. She says the NFL will not override those agreements but will seek blocks of rooms that have not already been committed to the boat shows. Grossman says the Super Bowl host committee can shift the locus of the Super Bowl — NFL headquarters, team accommodations, Bowl-related activities and blocks of rooms — to Broward County, which Miami’s Super Bowl host committee did in 2010 at the NFL’s request because the Super Bowl had been held in Miami just three years earlier and it wanted a different feel for 2010. She says that will avert conflicts between the events. She says Miami’s Super Bowl host committee hasn’t met yet to discuss these options for shifting the focus to Broward but will have to decide and submit its bid in March. Also, expanding the NFL’s regular season to 18 games requires agreement from the players’ union, which opposed the league’s proposal to add two games to the schedule in the latest labor negotiations. An 18-game season was not part of the 10-year collective bargaining agreement reached in 2011. A third obstacle: Miami’s aging stadium is vying with San Francisco’s new $1.2 billion stadium. Steve Ross, the owner of the Miami Dolphins’ Sun Life Stadium, has proposed an ambitious plan to upgrade the stadium — build an open-air canopy over the seating, move the stands closer to the football sidelines, add 3,700 seats, install wider, more comfortable seats and giant high-definition video boards — at a cost of $375 million to $400 million. Ross wants to pay about half that with public money (tourism taxes), but many are looking askance at the idea after Miami-Dade kicked in 80 percent of the $634 million to build the Miami Marlins’ new Major League Baseball stadium, then saw ownership trade away the team’s best (and best-paid players) for cheaper prospects after a dismal 2012 first season in the new stadium. Whichever city loses out for Super Bowl 2016 will compete with Houston for Super Bowl 2017, so if Miami doesn’t win the bid for Super Bowl L, presumably the potential conflict between boat shows and the Super Bowl still will be an issue for 2017.